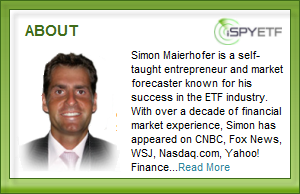 Throughout this bull market, a buy the dip approach was virtually guaranteed to be succesfull. 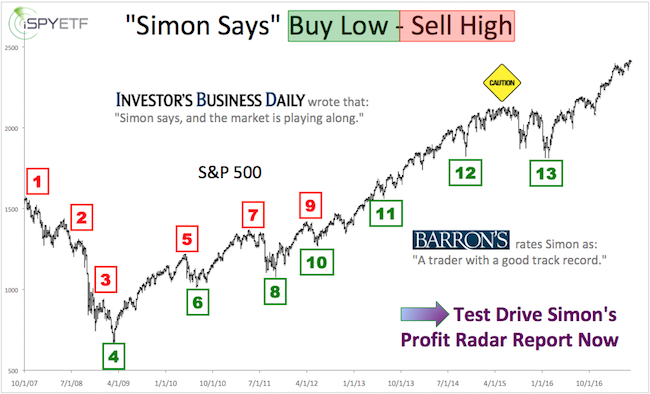 This guarantee was removed at the September high, but that doesn’t necessarily mean that buy the dip is dead. To assess the S&P 500 crash vs buy the dip odds, we will first compare the January 2018 with the September 2018 all-time high. 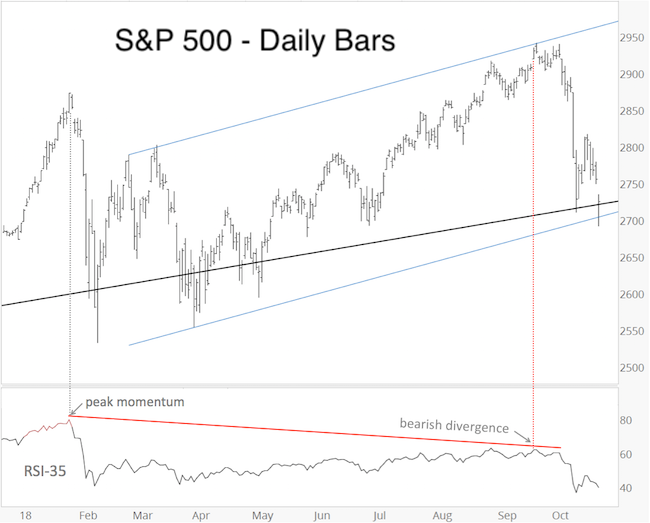 The January S&P 500 high (2,872.87) was accompanied by record high momentum/RSI readings (see second chart). Bull markets never end on peak momentum. 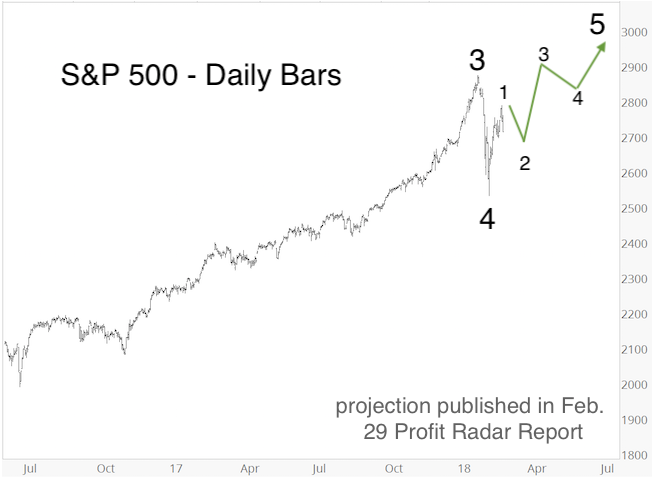 This virtually guaranteed that the January high would be exceeded eventually, which is why the Profit Radar Report published the projection below back in February (my up side target was about 3,000). The S&P eclipsed the January high in August, and again in September. By that time, various bearish divergences (including RSI) became obvious. Continuous all-time highs were no longer guaranteed, and down side risk began to outweigh up side potential. 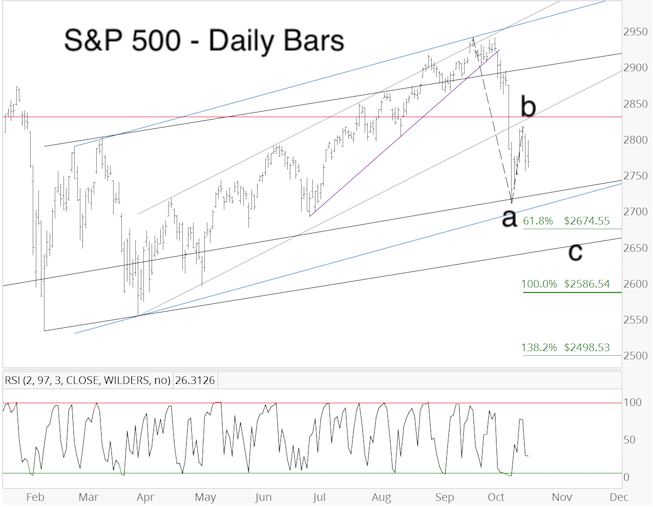 The October drop was likely a game-changer in term of Elliott Wave Theory, which now suggests that some sort of orthodox top is in place. Bullish seasonality, however, should not be ignored, and even a counter trend bounce (according to Elliott Wave Theory) could still challenge or exceed the orthodox October high. 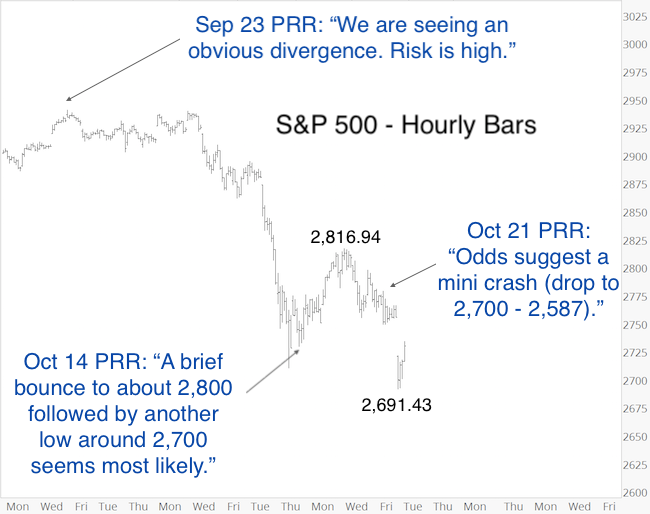 Subsequently, the S&P bounced as high as 2,816.94 and today fell as low as 2,691.43. Today delivered the mini crash (from 2,755 - 2,691), and based on the reversal, this leg down may have concluded. Next question is how long will this bounce last?